Average Weight	: 20 - 25 lbs. The Kooikerhondje is an old Dutch race bred to lure ducks into traps. 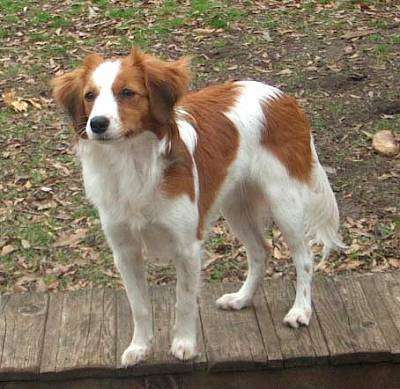 The Kooikerhondje can be seen in paintings from the 16th and 17th centuries, but didn't become an official, recognized race until June 18, 1966. Unfortunately, by the end of World War II, when dwindling duck stocks left the Kooikerhondje out of a job, the breed almost became extinct. In all it is thought only 25 Kooikerhondjes were left in existence. In 1939 Baroness Van Hardenbroek van Ammerstol decided to resurrect the little Kooikerhondje. The Baroness lived alone in a very big mansion and was dedicated to her dogs. She was quite an eccentric woman and had her dogs join her for dinner. Each dog sat at her table in its own chair. During WWII the baroness helped many allied pilots to flee the Germans and used her dogs to guide the men through the woods to the Belgian border. The Baroness was also involved in the rescue of several other Dutch breeds (the Keeshond and the Drentse Patrijshond). In order to rebuild the Kooikerhondje, the Baroness prepared a detailed description of the ideal dog and asked traveling salesmen to look for a dog that fit those criteria. At long last, her efforts were rewarded when word came back of a female named Tommie on a farm in the northern province called Friesland. The Baroness went to Friesland, and was delighted to discover that Tommie did indeed fit the description. Fortunately, the farmer, who would not sell Tommie, agreed to lend her to the Baroness for breeding. Tommie was taken to the Baroness's home in Geldrop and the Baroness began her searched for a fitting dog to mate her to. Eventually, she found a suitable dog named Bobbie and he sired Tommie`s first litter. Unfortunately, the Kooiker became much less useful as duck decoys became increasingly unpopular, and by 1939 only about twenty-five Kooikers were thought to still be in existence. Due to the efforts of eccentric dog breeder Baroness von Hardenbroek, the Kooiker made a spectacular reappearance, and the breed was formally recognized by the Dutch Kennel Club in 1966. The Kooiker remains rare in North America, but efforts are being made to popularize the breed. The Kooikerhondje is a medium-sized dog, similar in size and appearance to a spaniel. If there's one word to describe the average Kooiker, it's "friendly"--provided that the Kooiker knows you well. Unfortunately, Kooikers don't have nearly the same enthusiasm for getting to know other dogs or cats, and won't always take well to other animals that they haven't known from an early age. There's a flip side to this general friendliness, of course: the problem of the Kooiker who isn't taught from birth to enjoy the company of humans. Kooikers in general, although enthusiastic, are also quite sensitive to the tone of people's voice and to being touched--qualities that make them good watchdogs, but that can sometimes be problematic when the Kooiker is primarily being used as a family pet. If a trainer is careful and willing to spend a great deal of time with the Kooiker in its youth, Kooikers' sensitivity to human beings will be lessened to some extent, at which point its enthusiasm for its friends and family makes it one of the more charming breeds in existence. But Kooikers, however well they're trained, will always have a few problems with some types. Children in particular can easily upset the Kooiker if they're too prone to shouting at or roughhousing with the dogs, and harsh trainers can actually undo important training work and make the Kooiker much less useful and friendly. So as the saying goes, "choose your friends wisely"--as well as your Kooiker's friends. Once a Kooikerhondje knows his trainer and masters, they become loyal to the point of legend. Prince William of Orange owned a Kooikerhondje named Kuntze who, in addition to his many other valuable services, literally saved the Prince's life by deliberately waking him up during an assassination attempt. While of course not everyone expects this level of usefulness from their Kooiker companion, the dogs still show this same basic quality of loyalty to those who train them and will aggressively bark at anyone who's actively threatening you or your family--while remaining reserved yet fairly quiet to anyone who seems harmless, but who is as yet unknown to the dog. Because Kooikerhondje are extremely well-bred dogs with almost no known health problems. For those who hate the sometimes tedious work of dog grooming, the Kooikerhondje will come as a welcome surprise: Kooikers require very little maintenance or grooming. Their long coat does require a good brushing with a standard dog brush about once a week during most of the year, with more frequent brushings during the shedding season. Kooikers were bred for duck hunting--a sport which involves lots of running, chasing, and retrieving on the part of the dog. Kooikers still have this predilection for activity as a strong part of their genetic heritage, and you'll have to be the one to make sure that they get all of the excitement and action that they crave. As former decoy dogs, Kooikers thrive on games of fetching or chasing. If you can find a decently-sized park in your area--or if you simply live in the countryside--you can get a great deal out of your Kooiker by throwing a ball into some brush and waiting for the dog to happily retrieve it, burning all of that excess energy. It's not always a wise idea to give children the responsibility for exercising a Kooiker. Kooikers are upset by unwanted touching, loud noises, or general roughness--all of which children are capable of to an upsetting degree. If you do ask your children to exercise your Kooiker, make sure they know about the dog's sensitivity and ask them to be careful--although Kooikers' loyalty rarely wavers, you don't want your kids to upset the dog and possibly lose a week's worth of dedicated training. Kooikers are also noted for their love of swimming. If you have a dog park, river, lake, or other source of water nearby, you can both delight your Kooiker and drain off some of that excess energy in one single action by allowing the dog to swim to his or her heart's content--if anyone gets tired of swimming, trust us, it'll be you. Kooikers are very intelligent dogs, but they come with two significant problems for trainers to overcome. One is their natural tendency toward exuberance. The other is their natural inclination to like some humans and other animals intensely, while disliking other animals and humans with equal intensity--which can lead to some very powerful behavioral problems. The solution to these problems when training is to use your tone of voice effectively to discipline and reward your dog for his or her behavior. This doesn't mean that you should simply shout at the dog whenever it does something wrong, or that you should simply pet the dog whenever it does something well: Kooikers are naturally reticent about being touched by people they don't know very well, and their sensitivity to people's voices makes shouting at them too traumatic to be fully effective as a training mechanism. Instead, speak quietly but firmly to the Kooiker whenever he or she does something wrong. The Kooiker's natural sensitivity will add the necessary severity to your words, and the dog will, over time, avoid the behavior. You can reward your Kooiker for good behavior through play and exercise, giving the dog a needed burst of energy. If your training program involves a good deal of exercise, you can delight the Kooiker and teach him or her at the same time--Kooikers thrive on both learning and activity, after all. One positive reward that you should generally avoid, however, is food. Kooikers have notoriously large appetites and can gain weight very easily if their diet isn't regulated properly. Although this makes training a Kooiker through treats useful in the short term, it can create some long-term problems with the dog's expectations and behavior over the long training period--if you're trying to keep the dog's weight down, you won't be able to give it fattening treats in response to good behavior, which breaks a crucial component of the training cycle. Rely instead on exercise and positive praise in a friendly tone of voice.